Appsforlife Origami - Fold up your die drawings in Illustrator! Origami works with Adobe Illustrator. Origami connects directly to Illustrator, so you see your layout in 3D immediately without exporting anything and much more! Origami connects directly to Illustrator, so you see your layout in 3D immediately without exporting anything. 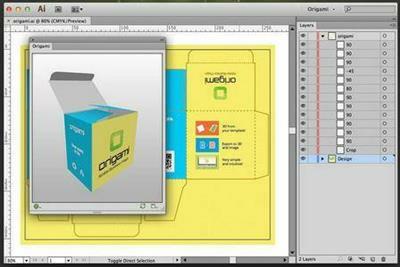 Origami lets you save your folded layout as a 3D shape or image for further processing, or to share with customers. Origami features probably the easiest user interface ever! Manage your dieline with path names and line styles directly in Illustrator. 1. Put your die drawing in a separate "origami" layer. Leave the other artwork as-is. 2. Set cut lines to be solid, crease lines to be dashed. Set up folding angles and mark the bottom part. 3. That's all! Now enjoy the 3D preview of your layout. 4. Save the image or export the 3D model for further processing.